The lizard is slowly making his way home, up the chestnut pathway to the safety of the leafy branches. This guy was spotted in a garden centre, and it seems he hangs out in this tree most of the time, probably because there are plenty bugs and insects in the knobbly bark. Following on from yesterday’s photos of the Drake Sail, this is a shot taken further down the river, at Drake’s Pool, where many boats are moored and sheltered by the natural harbour and the bend in the river, keeping the worst of the winds from the sea away. 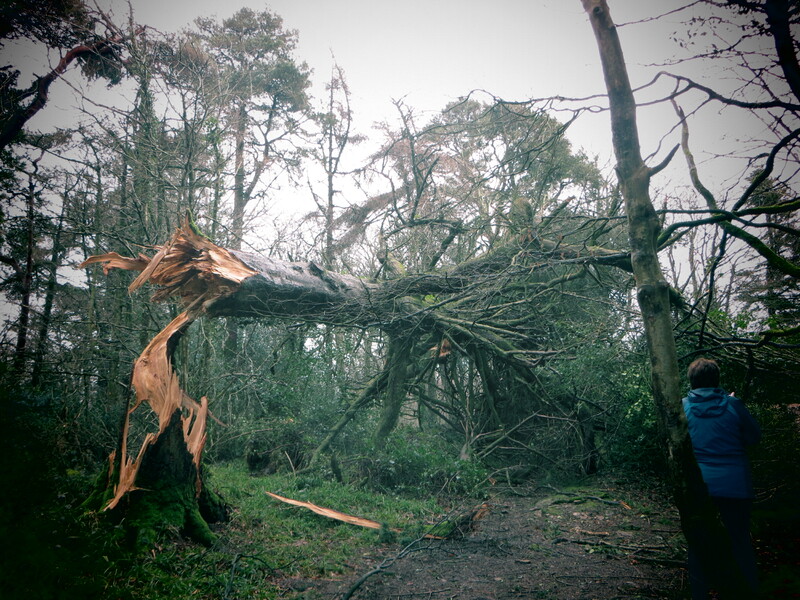 Then again, nature is not always kind and serene, and during a very severe storm in Ireland earlier this year, many large old trees like this one were destroyed by the force of nature. It’s another one of those stormy days in Cork, and on my way to the shops today I came across these two magnificent trees that were uprooted in the gales a few days ago. These trees have been there for ever, and it only took one very bad storm to knock them over – luckily the farmhouse is set well back from the road, otherwise there could have been a lot of damage done.